Steelroll Commercial Galvanized Roller Shutters with single-phase Tubular Motors are British-made, sold by us at heavily discounted prices. They can come powder-coated in a full range of BS and RAL colours. Heavy duty 22 gauge roll formed lath. 20 gauge on larger doors. Heavy duty single phase tubular motor. There are three widths of guide channels available. The 90mm wide heavy duty extruded aluminium guide channels with built in draught strips for draught reduction and quieter opening and less rattle than a standard galvanized roller door; 70mm guides available on smaller shutters where side room is limited; 150mm guides available for extra security, very windy locations, and on wider doors. Full box enclosure is either White or Brown powder coated aluminium. L or T shaped bottom lath for increased strength. Chain hoist operated shutters, on request. 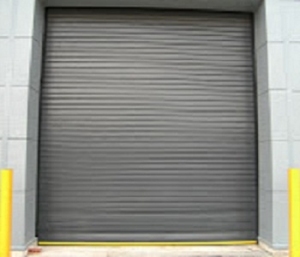 This single phase, electric, steel roller shutter is a high quality example of this type of industrial roller door. Quick lead times, delivery on factory transport and technical help. Installation service available. Please send sizes and photos for an accurate and competitive quote. In house, state-of-the-art, powdercoating plant ensures any doors made in a RAL or BS colour have tight quality control and quick lead times.